I could have merely spoken of a walk along the beach, but, I wanted to emphasize something subtly different than such a stroll. An ecotone is a place where ecologies are in tension (in Greek, the word is tonos). It describes the boundary between two communities of plants or animals with differing characteristics. 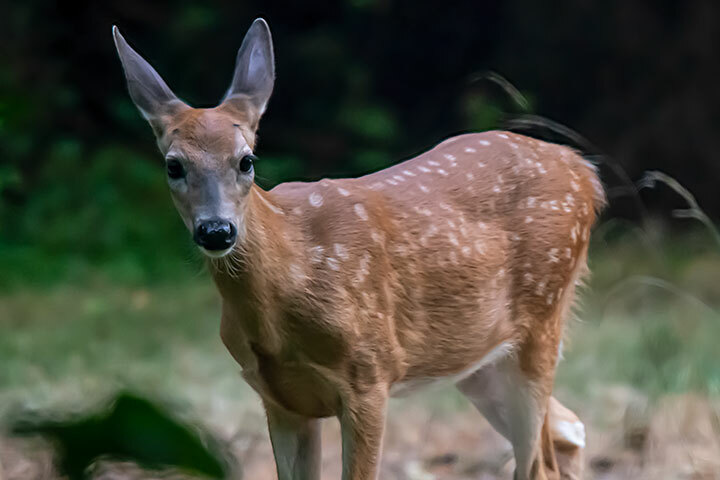 The ecotone is where the disparate communities meet, allowing an ecotone walker to witness the variety that comes with different wildlife communities. In particular, a beach walk can enable wildlife sightings of creatures that favour the lake, the shoreline transition, adjacent grasslands, and even the forest. The creatures shown, all seen this last week, are but a sample of the rich life to be seen on such a walk. First, a view over the water. 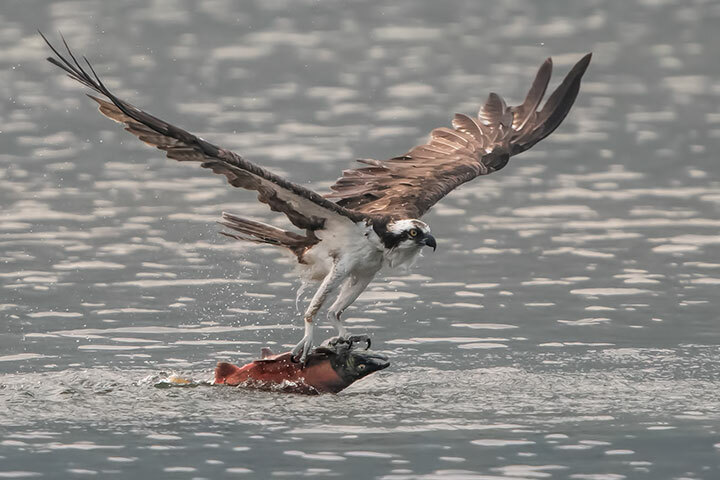 The osprey and its captive Kokanee are both endemic to the lake. Then there are the creatures of the ecotone, those that live and hunt in the boundary between water and land. 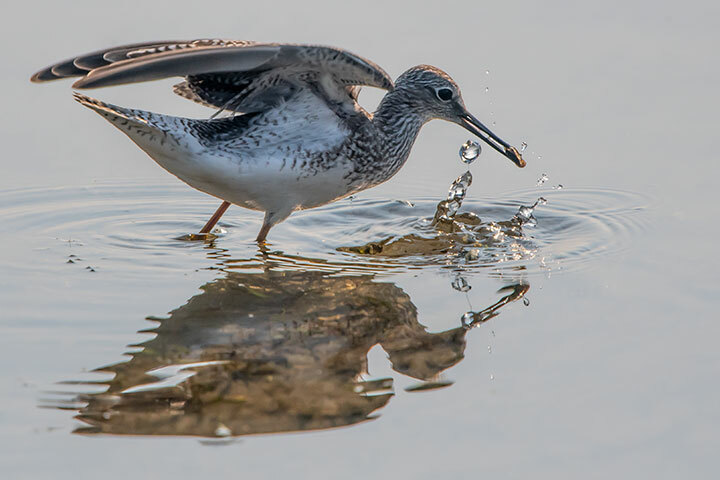 A Lesser Yellowlegs Sandpiper grabs arthropods from the shallows along the shore. 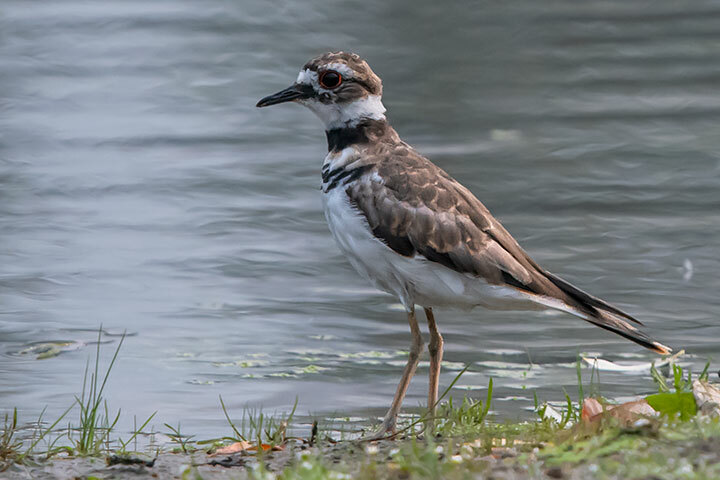 A killdeer hunts along the shore side of the water’s edge. 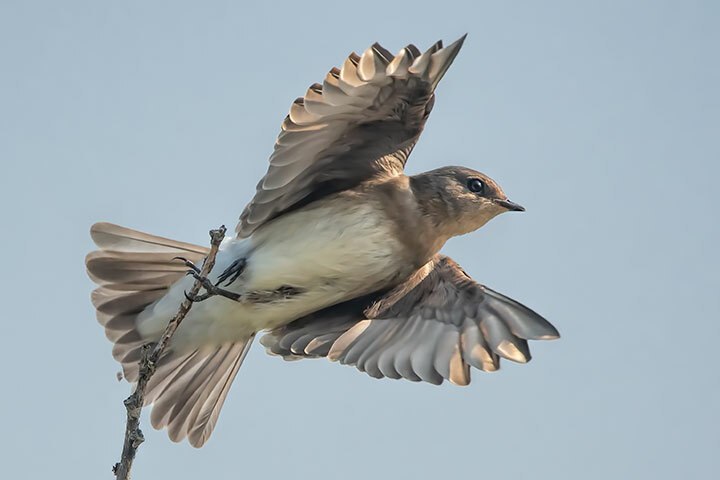 A Northern Rough-winged Swallow forages for insects on the wing, sometimes doing so over the water and sometimes over the adjacent land. One can also see creatures that specialize in the land side of the ecotone. 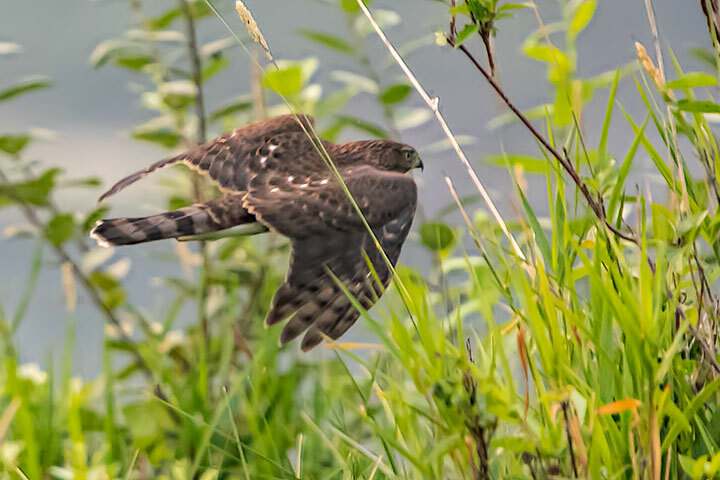 The Cooper’s Hawk is a forest raptor that eats small birds. Here it is hunting in the grasslands between the water and the forest. And a peek into the forest reveals the dark eyes of a fawn looking back. This entry was posted in birds, commentary, fish, mammals. Bookmark the permalink. Ecotone…my new concept for this day along with the so fine photos…many thanks, Alistair! When can we [be] done with the arrest of witnessing the variety of life? The notion of a boundary is a hot one and full of terror and dazzle. But the most undetected and therefore with only feeble attempts at rapprochement is that between the human and natural worlds. Margins are dominated instead by paradigms of predation which we use to rationalize tyranny and anarchy. The communities formed by animals are full of hierarchies and pecking orders, fights over territorial disputes, and the like. Doug, the divisions I spoke of are based upon ecology. It remains, the skills that wildlife need to survive in the lake are different than those needed to survive in the grasslands. Consequently, the residents and their behaviours differ. Saying this is both to observe the obvious and to recognize why it evolved. So, I like observing near boundaries owing to the variety of things and behaviours that can be seen. When I post about the natural world, I am never — repeat, never — doing so as a metaphor for the human condition. To use the behaviour of nature as a device to justify or condemn human behaviour is a practice historically fraught with self-serving nonsense and bad policies. My blog does not do this. Rather than looking inward to the behaviour of humans, it looks outward to the behaviour of nature. That is all; there are no hidden messages in what I post.